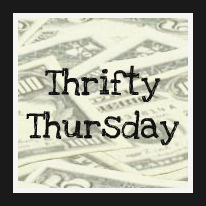 I am SO excited to share this weeks thrifty find, it will be saving me so much money! A few weeks ago I was talking to a friend about how expensive our auto insurance seemed for the ONE vehicle we had that is 15 years old. When she almost choked at how much it was I knew it was time to do some comparison shopping. The first thing I did was to call my insurance company and see if they could get me a better rate. My agent said he would see what he could do and call me back. When he called me back he gave me a whole list of excuses reasons why that was as low as it could go, and it had dropped recently too! By 60 whole cents! Woo! Nevermind the $20 it had gone up 5 months ago. Apparently the parts for our car are very expensive and that is why we were paying so much. After about 15 minutes of listening to him I told him I was going to have to hang up as I really just couldn't listen to any more. I am almost ashamed to say how long we have been getting gouged through that company, whose hands were in no way good to us. I can't believe that someone who loves a good deal as much as I do didn't even think about how much we were paying. I had thought a couple of times that it did seem like a lot for one vehicle when neither of us have anything on our records, no accidents and we have good credit. While I wish I had done this sooner, I am just so thankful we did it now! I went in to a local agency who was able to give me a quote on full coverage for our 15 year old car and on renters insurance. Not only were they friendly, they explained everything very clearly to me and I felt like they did a more thorough evaluation on our house contents for the renter's insurance. The quote they gave me almost knocked my socks off! The amount just for the car was less than HALF of what we we've been paying. The Renters insurance was more thorough than what we had and was $7 less a month. Then we added the new van into the mix and the old insurance was going to add on $12/month for just liability. I have no idea how much it would have been for full coverage but I would guess it would have minimally been an additional $25/month. That was not going to fit into our budget! We will be saving minimally $588 a year!! Not only are we saving money on it, we are getting more coverage! I was showing my 11 year old how much we are saving and he said "that is almost enough for an iPad!". Why, yes son it sure is! I love that he gets excited about some of my money saving adventures! Obviously this will not be the case for everyone, but I do urge you to get a second opinion if you feel you may be paying too much. I am so glad I took the time to look around. This was definitely my best deal of the week!